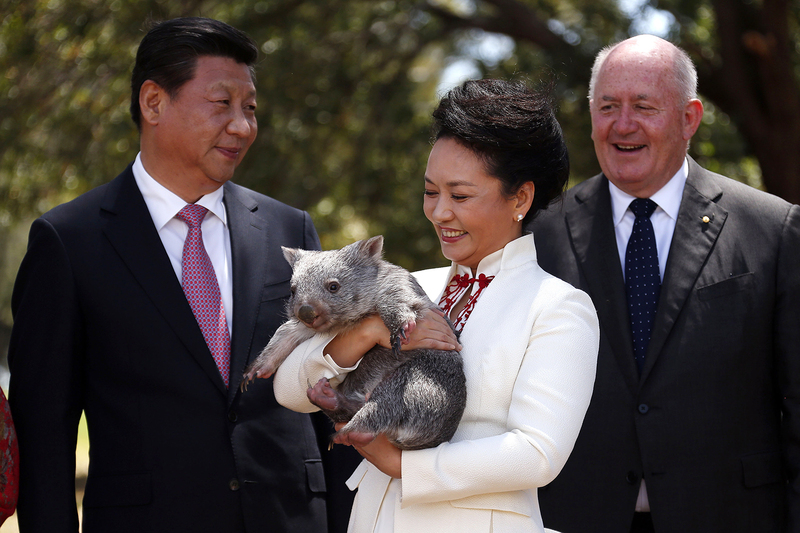 Australian Governor-General Peter Cosgrove (right) stands with China’s President Xi Jinping (left) and his wife Peng Liyuan, holding a wombat, on the grounds of Government House in Canberra, Australia, November 17, 2014. Those of us in Australia who follow China have long sensed that Chinese funds have poured into Australia. Political parties and many politicians have received large donations. Chinese companies have received permission to make large investments. Chinese have purchased Australian real estate, raising the cost of the real estate market and making it impossible for young Australians to buy housing. At the same time, China has become Australia’s leading trade partner and the balance of trade has been in Australia’s favor. At least to some extent, Australia seems to have moderated criticism of Chinese expansionist behavior in such places as the South China Sea. Australian statements critical of China seem lost in a wider sea of praise. This trend came to an abrupt halt in the last week. Fairfax Media (led by The Age in Melbourne and the Sydney Morning Herald) and the “4 Corners” program of the Australian Broadcasting Corporation jointly launched an investigation into Chinese attempts to buy influence in Australia. Several things became very clear. First, unlike the United States, Canada, Britain, and the European democracies, Australia has virtually no laws or controls over political donations. Foreign countries, citizens, and companies are free to make substantial political donations and both the ruling Liberal-National coalition and the Australian Labor Party have accepted numerous large donations. The results have been clear in a number of cases where some Australian politicians have backed Chinese policies. Fortunately, it finally looks like both major parties as well as the Greens are ready to implement controls over foreign political donations. Second, China clearly attempts to control dissenting Chinese voices in Australia. This is done through pressure on the families in China of Chinese residents and Chinese-Australian citizens here. While the Fairfax-4 Corners investigation did not mention this, such pressure on families in China has caused academics in Australia from China to soften and censor their own research writing. Third, as has long been well-known, the Chinese organize student associations which pressure students to support Chinese policies and to suppress dissent. This happens in classrooms and it also happens publicly when the Chinese Embassy supports student demonstrations in support of China during state visits or to counter demonstrations against China such as during the Beijing Olympics. The Chinese clearly use our democracy to push their own policies, but they forbid dissident Chinese from expressing their own views. A good example of Chinese influence is the establishment of the Australia-China Relations Institute (ACRI) at the University of Technology, Sydney (UTS). Originally, UTS had some very good China studies programs and research. These were closed down and a big donation from two major Chinese investors in Australia established the ACRI, headed by former foreign minister Bob Carr. Although Carr performed adequately as foreign minister, before he became foreign minister and since he has spouted Chinese policies. ACRI too has become a Chinese mouthpiece. These issues are not unique to Australia. The Chinese Ambassador to Chile, for example, interferes in the Confucian Institute at a Chilean university in order to support Chinese policies in a way that has never occurred in Australia. In the United States, Chinese also interfere in politics with such people as Jared Kushner, President Trump’s son-in-law and adviser, involved in China policy in ways that suggest conflicts of interest. Even though American campaign contributions are much more tightly controlled than in Australia, some American politicians spout Chinese policies because they hope to increase exports. Democratic powers have much less ability to bring influence to bear in China. As China becomes more powerful, Chinese influence in democratic countries is clearly an issue deserving broader consideration. Its apprehensive attitude towards its neighbors is after all not something new. This is a country that ran the infamous “White Australia” policy until only a few decades ago. Australia, what Mao Zedong called “the lonely continent,” has been nervous about its other neighbors since long before China figured prominently. Indonesia under Suharto until the late 1990s was an issue. Then there were the worries about Japan during its economic ascendancy buying up the nation in the 1980s. This is not to say the latest reports of increased Chinese influence in Australia are wrong. But it does put them in a broader context. So while Australia’s nervousness about its identity and role is well known, what is novel is that a country in its own region with wholly different values and political systems is now so present as an investor, trader, and supplier of immigrants and students. This is exacerbated by the uncertainty created by Australia’s largest security partner, the U.S.A., under its new maverick president, and deep internal divisions within the country itself, between the more liberal, outward-looking, and diverse cities, and the often profoundly conservative more rural or provincial areas. Through its geography, and its sense of vulnerability and isolation, Australia therefore offers a different sort of response to China than most other places. The U.S. has much more security and confidence, and so the China Threat narrative there is less stark. China figures as a problem in the Asia Pacific, rather than in America’s own sovereign space. For Australia, China raises much more intimate, almost existential problems. It is conceivable that Chinese investment could become dominant one day. Or that the trade dependence would carry increasingly overt, heavy political price tags. After all, China is very aware of its importance. And only altruism would stop it not trying to exert some influence where it sees opportunities—an altruism it has failed to show over any other issue, anywhere else. The People’s Republic of China’s (P.R.C.’s) influence in open societies such as Australia and the United States is a pressing topic for discussion. Nevertheless, moving beyond some of the headlines over the past week, we must remain focused on the real effects of such influence, which primarily targets so-called “overseas Chinese” communities. Certainly, as the Four Corners report made clear, there are very real concerns about murky political donations and influence peddling at the top. But such concerns are, at the end of the day, precisely why we have a free press that engages in this type of detailed investigation. If we are all honest with one another, no matter how many donations are made, how many clumsy Beijing-based “news” supplements are inserted into newspapers, or how many A.C.R.I. polls are conducted, in an open society in which people are free to debate issues openly and logically, there seems to me to be little risk of political elites or general public opinion in Australia or the United States shifting in favor of Beijing’s frankly preposterous and expansionist claims to Taiwan, Tibet, and the South China Sea. Mainstream Australian media has finally discovered China’s “soft power” in Australia. It is an important debate, relevant to the United States and many nations in the Asia-Pacific region and beyond, as China becomes an increasingly global power, projecting its influence well beyond its immediate region. It is also important that the media, political leaders, and opinion-shapers remain level-headed, well-informed, and balanced when assessing China’s “soft power” impact. Three key issues are at the heart of the Australian debate—Chinese diaspora and its role in projecting Chinese power, foreign political donations to the Australian political parties, and Chinese students and philanthropy. The Chinese diaspora in Australia—close to 1 million ethnic Chinese Australians—is a vibrant, entrepreneurial, and influential community whose history “down under” is as old as the Australian Federation itself, and whose contribution to Australia is significant. The Chinese government has long been directly involved in shaping the opinions of the Australia-Chinese community though Chinese language media and various “friendship associations” and community groups. The 4 Corners/Fairfax investigation reveals an extensive campaign by Chinese government actors to eradicate or diminish any dissenting voices within the community criticizing the Chinese government and the Communist Party. Clearly, this is not an acceptable practice in democratic societies such as Australia and the United States, and should be condemned and limited. But it also poses a highly complex question of legitimacy and allegiances. While the current Australian debate profiled the dissenting views (such as Professor Feng Chongyi), many of the Chinese Australians (especially those born after 1949) would view the Chinese Communist Party as a legitimate, benevolent force for good, inseparable from the Chinese state and China’s course of history. They will genuinely view attacks on the Party as attacks on China and its people. As democratic, pluralistic societies, Australia and the United States would have to accept that some of its citizens would view the Chinese Communist Party favorably. This creates a complex question that neither the United States nor Australia have yet to properly examine and debate. It underlines the importance of inclusion, cultural diversity, engagement, and empowerment of Australian (and American) Asian communities, highlighted, for example by Australia’s Race Discrimination Commissioner Dr. Tim Soutphommasane, and in the case of non-English language media by Professor Sun Wanning. It leads us to the second question at the heart of the debate—significant donations to the major Australian political parties by Chinese donors. The investigation revealed an alleged attempt by the Chinese political donors to influence the opposition Labor Party’s foreign policy position on the South China Sea issues. Australia is one of the few countries that allows political donations from non-citizens. After the current Four Corners/Fairfax investigation, this policy is frankly untenable and needs to change. But what if the political donors are Australian citizens of Chinese descent? Will they be treated any differently from American, Russian, Israeli, or Saudi Arabian donors? Will the fact that the donors come from countries with no parliamentary democracy prohibit them from actively engaging in a democratic political process in the country of their citizenship? The same goes to the question of Chinese philanthropic donations to Australian universities and cultural institutions, and the role of Chinese students on Australian campuses in pro-Chinese government events and demonstrations. China is clearly emerging as a major philanthropic power. This year’s Hurun Philanthropy List shows an upward trend in donations by China’s wealthiest, with 44 percent of donations going towards universities and educational causes. This is a welcome trend and should be encouraged and celebrated. It in some way closely follows and repeats the history of the American philanthropy of the 20th and 21st centuries. Australia has been a major beneficiary of both Chinese student mobility and philanthropy. More than 50,000 Chinese students enrolled in Australian universities and schools last year, up 23 percent from 2015. Close to 30 percent of all international students in Australia are from China. Their contribution and impact on Australian universities is a success story. Chinese philanthropy is also making an impact on Australian universities—with some of the major multi-million dollar donations to the University of Sydney and University of Technology Sydney coming from Chinese Australian and Chinese philanthropists. Yet universities have been largely silent on the issue of Chinese students’ mobilization for political purposes and academic freedom of the entities created through the Chinese philanthropy—for example the Australia-China Relations Institute, which is—as alleged by the Four Corners and James Leibold—serves as a vehicle for Chinese propaganda. This is concerning, if true, as safeguarding academic independence is a core value of educational institutions in democratic societies. But will we ask our universities to treat their Chinese students and philanthropists differently from others? The universities are silent, because they probably don’t have a solution, and because they are dependent on philanthropic and international student income to make up the shortfall of government funding. The political leaders are silent because they have not grappled with the very essence of Chinese power, and the impact of China’s rise on domestic policy, political, and social settings. Both Australia and the United States need to start figuring it out soon. And we need to do it in a balanced and informed manner keeping in mind the multicultural fabric of our societies and concerns of our diverse and pluralistic Chinese communities. The critics of the Four Corners program “Power and Influence” have been quick to move the debate away from the central issue of Chinese influence operations (known in the Russian context as one type of “active measures”). It may be racism. It may be incompetent counterintelligence. It may be ignorance of China. As someone interviewed for the program, I obviously accept that there is a problem. The challenge is navigating between ensuring the integrity of democratic political systems and preventing the kind of McCarthyite paroxysm that makes everything worse through self-inflicted wounds. This requires keeping focused on the issue: foreign government interference in democratic politics and the rules of engagement with the Chinese Communist Party (C.C.P.). As ChinaFile is a U.S. product, we should be clear that a number of the things reported on the Four Corners program would, in fact, be crimes if they occurred in the United States. Part of the reason for the program’s controversy is that Australia’s laws create massive openings for a foreign government to exercise direct influence without breaking any laws. The central question for Australians is not really about China so much as the kind of democracy they want. The Australians are not debating Chinese influence; they are debating Beijing’s attempt to exercise influence covertly and twist the integrity of Australian political system. These are distinctions with a difference. In the crudest terms, it is one thing to play a person’s emotional and intellectual weaknesses across the table; it is quite another to compromise them.